Expository essay sample: The life and times of the genius Stephen Hawking. Early Years. Stephen Hawking (1942 – 2018) is perhaps the most well-known physicist of his generation. He became a best-selling author of non-fiction, and popularized science worldwide. Hawking also battled with ALS (amyotrophic lateral sclerosis) for over 50 years, and became a champion of not only science, but also of the disabled. Despite this information being common knowledge, the majority of people do not know much about his personal life and career. In order to enlighten the public about this great man’s life, this essay will expound on Hawking’s timeline. Hawking was born on the 8th of January, 1942, in Oxford, England, to Frank and Isobel Eileen Hawking. Frank was a medical researcher, and Isobel was a secretary for a medical research institute. Stephen had two younger sisters, Phillipa and Mary, as well an adopted brother, Edward. The family was considered intelligent and a tad eccentric. Each family member was an avid reader, and they lived a frugal life in a cluttered house (Ferguson, Kitty). The famed physicist began his education at the Byron House School in Highgate, London. It was a progressive school, and Hawking later said that this institution did not allow him to read properly. Later, he attended the St Albans High School for Girls for a few months (at that time, boys were allowed to attend some of the courses). In turn, he attended two independent schools called Radlett School and St Albans School after passing the eleven-plus examination one year early. His father wanted him to attend the prestigious Westminster School, but at 13 years old, Hawking was seriously ill on the examination day for the institution’s scholarship. The family did not have enough money to attend the school without the scholarship, so Hawking stayed in the lower-class schools. However, young Hawking enjoyed his friends in his school, who would play board games together, make fireworks, construct model airplanes and boats, and have extensive conversations about religion and spirituality. 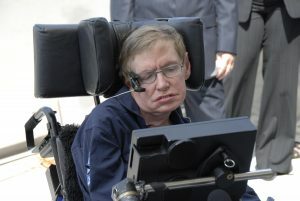 Though Hawking was not initially a bright student, he showed great aptitude in mathematics and science. Despite his father wanting him to follow the path of medicine, he garnered a scholarship to study at Oxford University on March, 1959, to study physics and chemistry (there was no chance to study mathematics back then at Oxford) (Fraser, Gordon, et al.). At the age of 17, in October of 1959, Hawking began his bachelor’s studies. The first 18 months were very easy for him, and he barely studied. But around the second or third year of his B.A. studies, he became more involved in school. He joined the rowing team, and found many friends with his wit and brash character. Hawking said later that he studied only 1,000 hours during his three years at Oxford. For the final exam, he answered only theoretical physics questions, and did not answer any questions that dealt with facts. The examiners of the test made him take an oral examination to place him in either second-class honors or first-class honors, which would determine where he would take up his doctorate studies. The examiners determined he was exceptionally bright, despite his apparent “lazy” academic record, and they gave him permission to attend Cambridge for his graduate studies by giving him first-class honors in physics (Ferguson, Kitty). After taking a short trip to Iran with a friend, he started his graduate studies at Cambridge on October of 1962. He was disappointed by being given Dennis William Sciama, a famous cosmologist, as a supervisor instead of astronomer Fred Hoyle. In addition to this, he thought the mathematical studies he engaged in was not good enough to work in general relativity and cosmology. Also, tragedy struck: he was diagnosed with motor neurone disease and he became depressed. He felt that working on physics would be worthless with a lack of time, as doctors gave him only two years to live. He began to have trouble walking and speaking, but the predictions of the doctors started to show to be untrue, and he got back to his studies with the encouragement of his supervisor. Ferguson, Kitty. Stephen Hawking: His Life and Work. Bantam, 2012. Fraser, Gordon, et al. The Search for Infinity: Solving the Mysteries of the Universe. Philips, 1998.